Designing floors now days are part of the modern infrastructure and giving them a fine look it is needed to apply various different kinds of tiles, stones like marbles or graphite which beautifies the floor better and then a good look also. 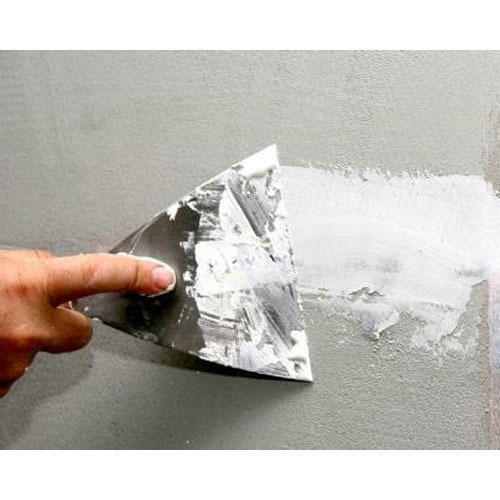 White cement putty is a powder which has coarse aggregate and it cast in sites with white cement which allows applying unique patterns. Once it gets applied or laid on the floor it gives a perfect gloss to the floor just as it gets mirror polished. It gives a perfect touch to the floor which beautifies the floor perfectly. Incorporated in the year 1996, we, "Sakshi Chem Sciences Private Limited", are one of the prominent manufacturers, exporters and suppliers of an unlimited compilation of Pre & Post Construction Chemicals. Our product compilation comprises of Industrial Oil, Tile Adhesive and Curing Compound that are processed in adherence to the predefined industry procedures at our end. To keep up with the flawlessness of the assortment, we procure supreme quality constituents from our dependable and trustworthy vendors. It is because of the quality and flawlessness offered that our chemicals are widely applauded in the construction industries. We are exporting globally. We are backed by a completely equipped production unit that contains all the necessary amenities that are required for the hassle-free processing and storage of the proffered chemicals. In addition, we have recruited a team of experienced professionals, who strive hard to meet the various client requirements, within the promised time period. We have gained Shahapurji Palamji Construction Company, B.G.R Energy Pvt. Ltd., Abhijeet Infrastructure Pvt. Ltd. and Nagarjuna Construction Company as our precious customers, in a very short time period of our service.